The state's nickname, The Land of 10,000 Lakes, is no exaggeration; there are 11,842 Minnesota lakes over 10 acres in size. The Minnesota portion of Lake Superior is the largest at 962,700 acres and deepest (at 1,290 ft (390 m)) body of water in the state. 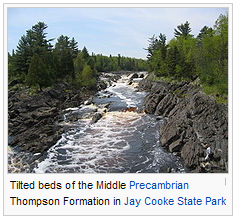 Minnesota has 6,564 natural rivers and streams that cumulatively flow for 69,000 miles (111,000 km). The Mississippi River begins its journey from its headwaters at Lake Itasca and crosses the Iowa border 680 miles (1,094 km) downstream. It is joined by the Minnesota River at Fort Snelling, by the St. Croix River near Hastings, by the Chippewa River at Wabasha, and by many smaller streams. The Red River, in the bed of glacial Lake Agassiz, drains the northwest part of the state northward toward Canada's Hudson Bay. Approximately 10.6 million acres of wetlands are contained within Minnesota's borders, the most of any state except Alaska. 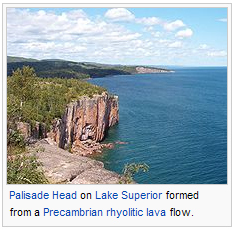 Minnesota's first state park, Itasca State Park, was established in 1891, and is the source of the Mississippi River. Today Minnesota has 72 state parks and recreation areas, 58 state forests covering about four million acres, and numerous state wildlife preserves, all managed by the Minnesota Department of Natural Resources. There are 5.5 million acres in the Chippewa and Superior National Forests. 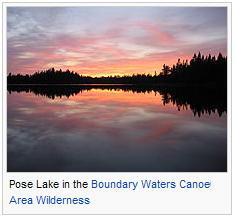 The Superior National Forest in the northeast contains the Boundary Waters Canoe Area Wilderness, which encompasses over a million acres and a thousand lakes. To its west is Voyageurs National Park. The Mississippi National River and Recreation Area (MNRRA), is a 72 miles (116 km) long corridor along the Mississippi River through the Minneapolis-St. Paul Metropolitan Area connecting a variety of sites of historic, cultural, and geologic interest.